Delighted to say that I’ve finally met in person with Jack Welde (@jwelde) of Smartling. We’ve been missing each other for about 12 months now due to our gallivanting around the world taking care of our respective responsibilities. 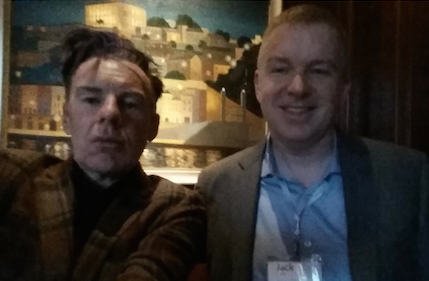 And where better to meet the man than at the Dublin Websummit (“Where the Tech World Meets”, as they say)? Myself and himself at the Websummit. A #selfie, naturally. I was impressed with Jack’s take on technology and localization. Here’s a man with a passion for linguistics and tech going right back to his UPenn college days and an internship with Professor William Labov. And, he has some serious startup chops already to his name. Jack’s thoughts on the need for simplicity, extensibility, the need to meet the needs of users and, above all, the potential offered by the power of the cloud resonated strongly with my views too. The cloud’s the platform of choice now. For everything. Developers, in particular, don’t want to be overburdened with complex workflows or have to write new tools to deal with their product’s localization needs. And, they know the cloud. I was knocked out to hear that Smartling had recently engaged with hundreds of developers on their own level at their #linguahack hackathon in Ukraine too. Jack also gave me a quick demo of Smartling itself, a cloud platform translation solution aimed as much at individual pockets of developers as at meeting enterprise-scale needs. I’ll explore the solution myself in more detail shortly, so stay tuned. The Websummit has been described as “Davos for Geeks”. I think it offers a lot more than that. Primarily, I think its value is one of networking on a grand scale, though with such a huge multinational attendance and such a broad range of startup and innovative activity present it would seem like an ideal place to watch out for potential customers of localization solutions too. In the past, I’ve written about when and how startups need to go global. Walking around the Websummit’s many venues it’s clear that many alpha and beta offerings are not ready for that step yet. So, perhaps there is a clear role for the localization industry to learn the language of the startup and developer crew and engage and help them pick what is the right moment to pull the trigger on the g-word. Overselling or scaring off this community by not talking the right language is essential. Thoughts welcome. Watch out for more insights about Smartling soon.